This is a hybrid of a salad dressing recipe favorite of mine and the perfect pairing of fall flavors. I have used Cranberry Pear Balsamic here, but any balsamic, flavored or not would work, as well as a sherry or champagne vinegar. Toss butternut squash with 2 tbsp olive oil, thyme, rosemary and salt and pepper. Roast for 20 - 25 minutes, until tender. Meanwhile, add pear, vinegar, sugar, shallots, rosemary and pepper into a small saucepan or skillet. Bring to a simmer, cover and reduce heat. Cook for 5 minutes, or until pear is tender. Transfer to a blender. Add the mustard and soy sauce. Puree until combined. Add vinegar while the motor is running. Blend for 30 seconds or until combined. 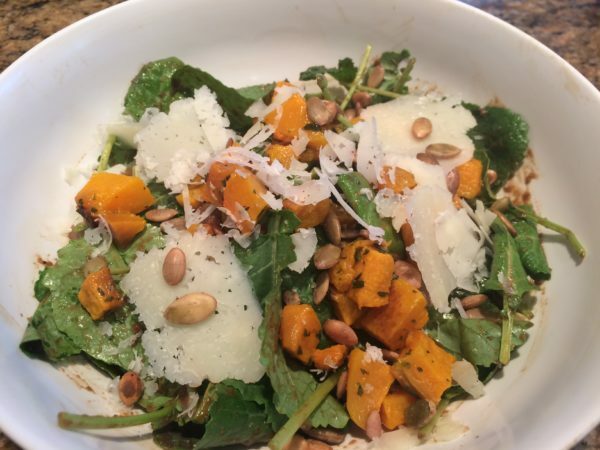 In a large bowl, combine the baby kale leaves and butternut squash. Add dressing and toss. Serve with the sliced manchego cheese and pepitas. You can also add grilled chicken. Enjoy!